It’s somewhat weird to be watching hockey in June, but I can’t turn off the tv because my Pittsburgh Penguins are in the Stanley Cup Finals. If you are a fan like me, there are a number of ways you can add some Penguin flair to your Stanley Cup Party. Penguin Head: Plum Party has some adorable Penguin hats that are conviently wearing blue (the Pens throwback color). At $1.50 for two, you must stock up on some of these guys. I would recommend bedazzling a Pittsburgh logo on to the hat – or adding a Pens sticker. 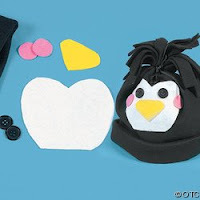 - With some creative pan usage, you can whip up this cute penguin cake. 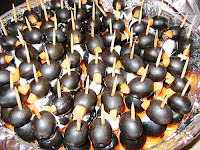 - I LOVE these Penguin olives from Sagespot on Flickr. This app can be put together easily with two olives, a tooth pic and a piece of cheddar cheese as a nose and a strip of cream cheese for the belly. You could also use carrots in place of the cheddar cheese. - For an easy penguin treat, create these cookies arranged from Oreos. No baking required! Penguin Pinata: While you never want to beat up on your mascot, there is a sweet Penguin Pinata you can fill with candy. Lord Stanley: Yes, you too can have a Stanley Cup at your party with this inflatable version courtsey of the NHL. Not everyone can "meet the cup" like a certain blogger (when she was wearing a Hooters t-shirt). I was daydreaming this theme last week and one of my favorite blogs, Hostess with the Mostess, actually posted a Penguin party on Friday. Click here for some adorable ideas she put together for a shower that can be applied to Pen’s party such as the olive app and cookies. Oh and of course…LET’S GO PENS!